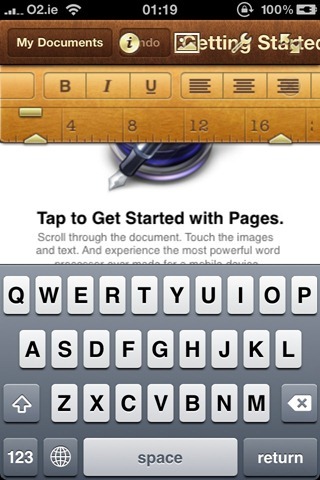 iWork suite will probably come to iPhones (maybe an iPhone 4 only exclusive like iMovie?) officially sometime this year. But apparently, an iPhone dev/hacker has already managed to get iPad version of Pages up and running on the higher resolution screen of iPhone 4. According to him, he has managed to do this by hacking the info.plist file in iOS 4 and then resigning it. @buzzert bit of Info.plist hacking and re-signing! The title bar though looks messy, but it is understandable considering the fact that this is iPad version of Pages which was designed for large higher resolution display of iPad. Hopefully, it will be available for everyone to download soon, along with other apps from iWork suite such as Keynote and Numbers. Not too hard, just add a “UIDevice”something to Info.plist and resign with iPhone Developer Tool so it'll execute. Problem? Just look at the screenie. I understand the desire for Pages and iWork apps on iPhone, but considering the current limitations found on the iPad versions (no sync w/ desktop, no print, etc. ), I'd much more recommend that iPhone users try alternatives. Both Documents To Go and QuickOffice are excellent office suites for the iPhone that have been designed to use its unique requirements in screen space and UI. But the iPad has it's own UI-elements, like a popover etc. Is it possible to use a element like that on a iPhone?